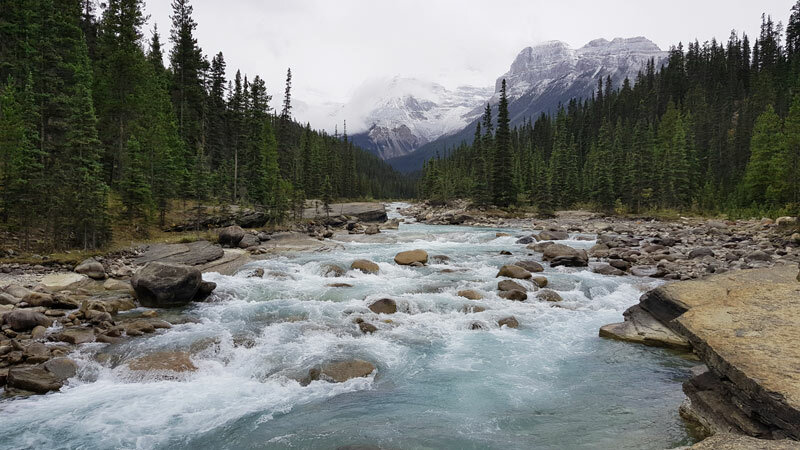 As promised, here is the first post on my travels through the Canadian Rockies! We had way too much fun for me to squeeze everything into just one blog post, so this is number one in a short series. 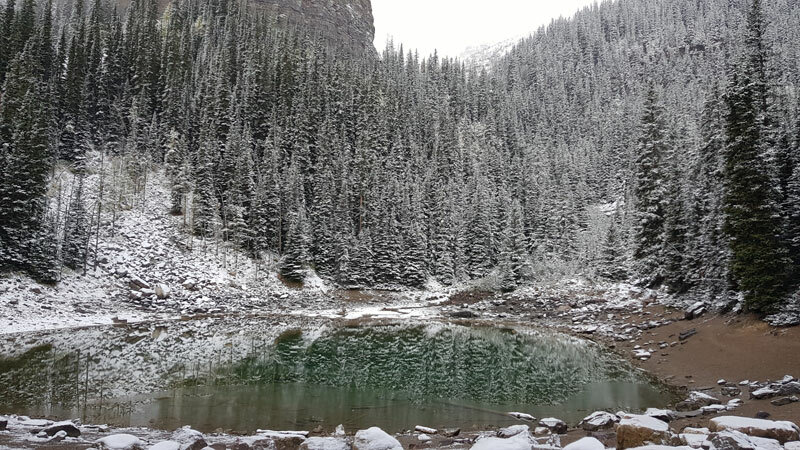 We visited Banff in Canada during the middle of September and unexpectedly, the region experienced an early winter! Huzzah! As we're from Bristol, we hadn't seen snow for over a year so this was an extra treat and believe me when I say we embraced the white fluffy stuff. It was basically Christmas come early. 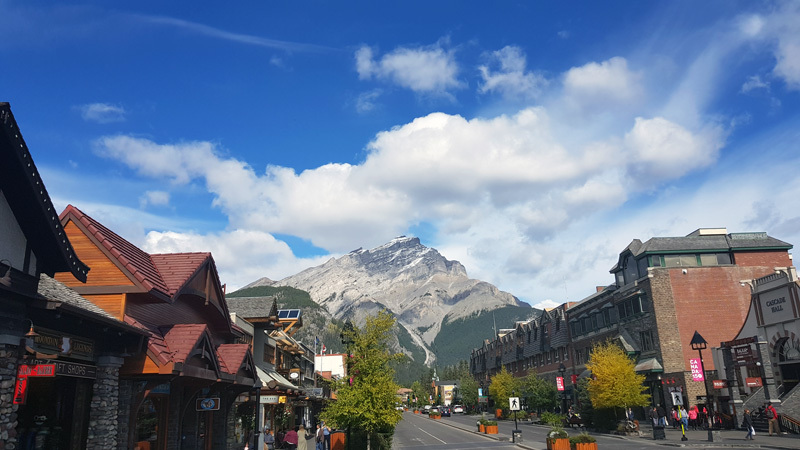 If you've been searching for places to visit in Banff, read on to discover my favourite 7 places to explore. 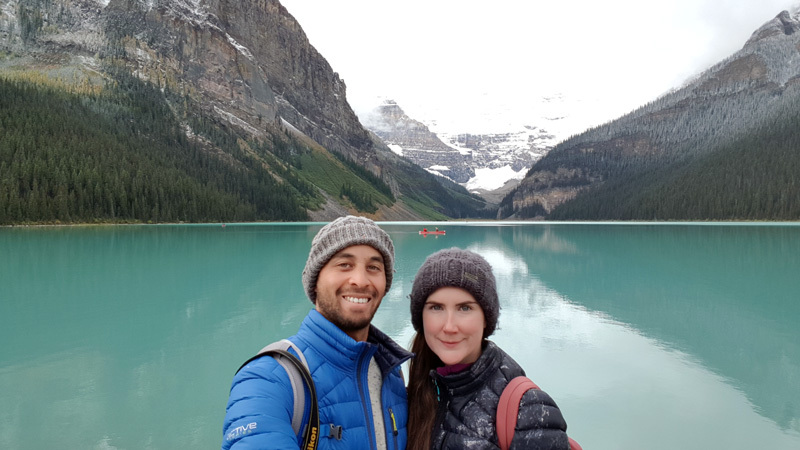 So if you've ever Googled Banff, you've probably read about/seen photos of Lake Louise. It's one of the most popular tourist attractions in the Canadian Rockies and tourists visit by the coach load, especially in summer. It's a good idea to get there early, especially as the onsite car park fills up quickly and strangers like to photo bomb. As it's a glacial lake which contains rock flour, it gives off an incredible turquoise colour - similar to Lake Tekapo in New Zealand. 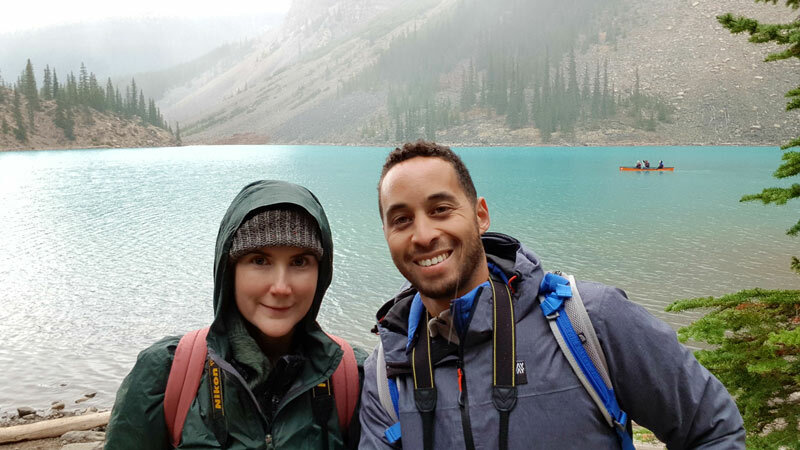 After arriving in Lake Louise and taking a few photos, we began a short hike to Lake Agnes, aiming for a pit stop in the adorable Tea House which was recommended by a friend (thanks Beth). As it had been snowing the day before, the hike was a little more challenging and I was jealous of the sensible older folk with walking poles. In the summer it would be an absolute breeze! The tea house is situated at an elevation of 7,005ft and is the oldest tea house in Canada! In 1901 it was a refuge for hikers but has been serving tea since 1905. As it's so isolated, fresh supplies are hiked in by staff almost daily. Cute. We were really impressed by the service and treats, it is a little expensive but it's worth it. Just make sure you take cash. Because it's so tiny, you'll want to get there early! 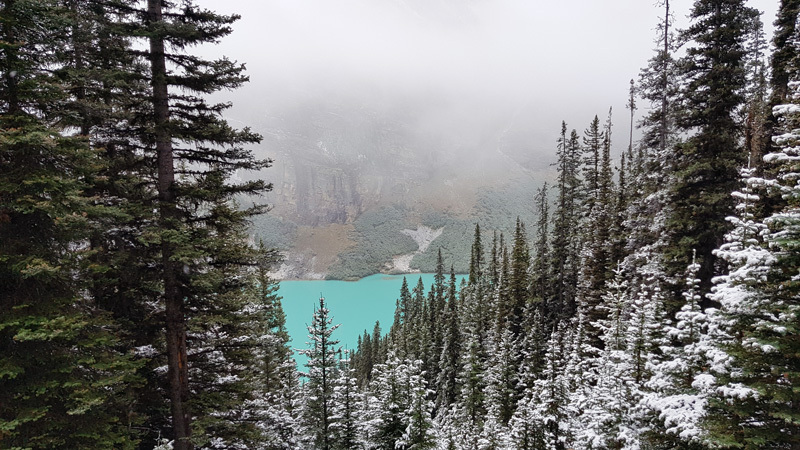 I'm not sure these pictures do Lake Agnes justice as it's so beautiful in real life! On the way from Lake Louise we passed another little gem called Mirror Lake which is also lovely. It's worth mentioning now that if you visit Banff, you'll want to stop every ten minutes to take photos of something. It's just that kind of place. 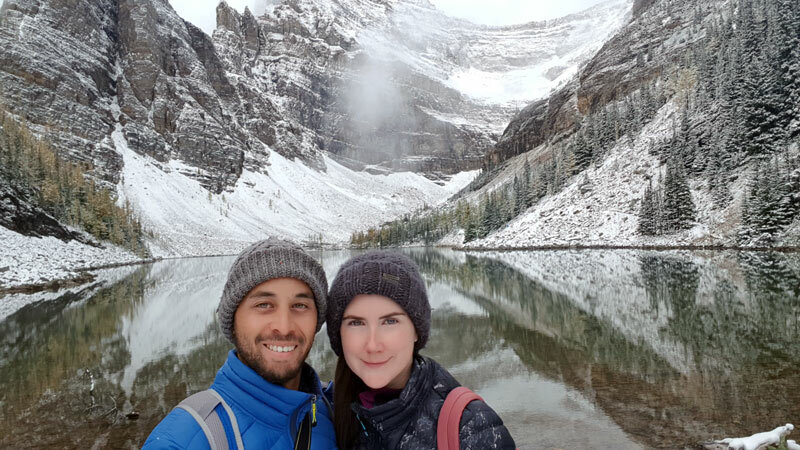 The first time we experienced snow in Canada was at Lake Moraine! We were contemplating hiring a canoe but at $95 plus tax (about £60) for 30 minutes it seemed a little lavish. 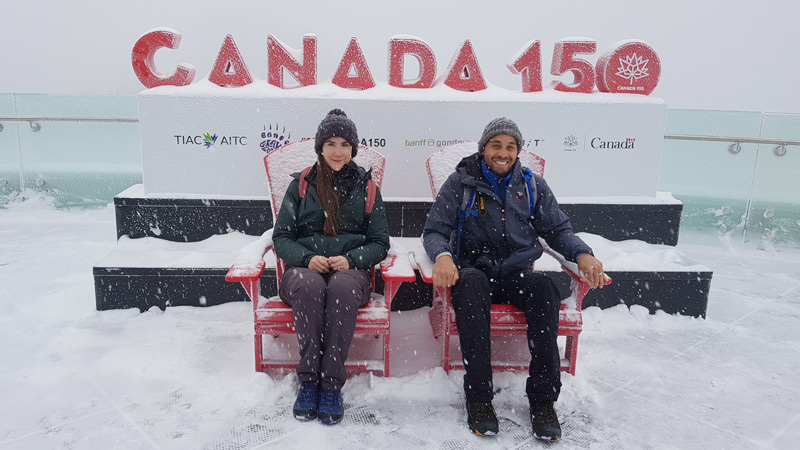 Turns out, we made the right decision because within about 15 minutes a mini snow storm hit (Canadians would probably consider this a very light dusting) and everyone in canoes had to be rescued! This was a moment of great excitement for us and after a quick dash into the gift shop and one hot chocolate later (they have souvenir shops everywhere in the Rockies) we made our way back to the bus queue. It's probably worth noting that the snacks/drinks are hella expensive. Ouch. We parked in an overflow carpark and used a complimentary shuttle service to and from the lake. This was also pretty fun in itself because we got to ride up and down the mountain in a yellow school bus... It felt like we were in an American movie! Well you obviously can't visit Banff National Park without swinging by Banff town. It is so darn sweet. Parking can be tricky but we managed to snag one of the longer stay parking spaces each time we visited. My good pal Chloe insisted we visit Evelyn's Coffee bar and if you go, you should too. OH MY. Guys, they do the best hot chocolate in the world and know I typed those words with such conviction. I love hot chocolate and this one was next level. The homemade cake is also delicious (full disclaimer: I went back more than once). We had a good wander around, the town has lots of popular shops you'd recognise like Gap, The Body Shop, Lululemon and North Face - but it also has plenty of independent stores and souvenir shops. 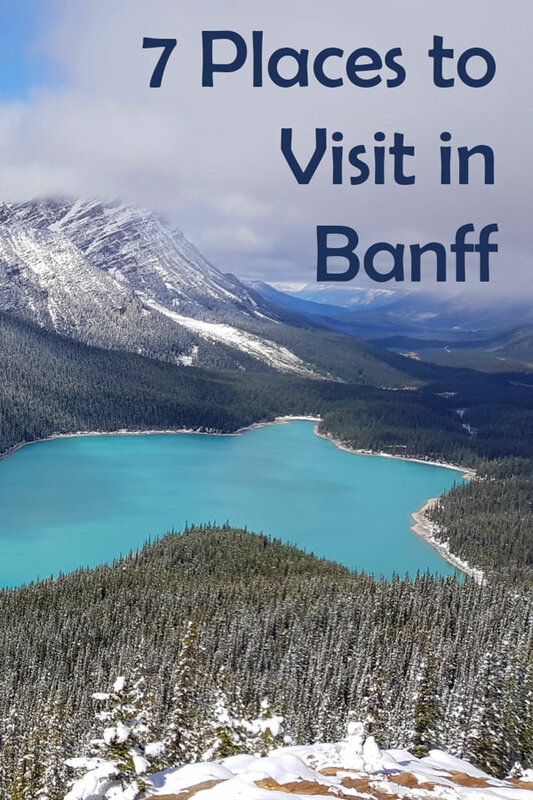 As we had one of the Brewster combo packages, we had tickets for the Banff Gondola! It appears Brewster has since rebranded and now goes by the name of Pursuit. 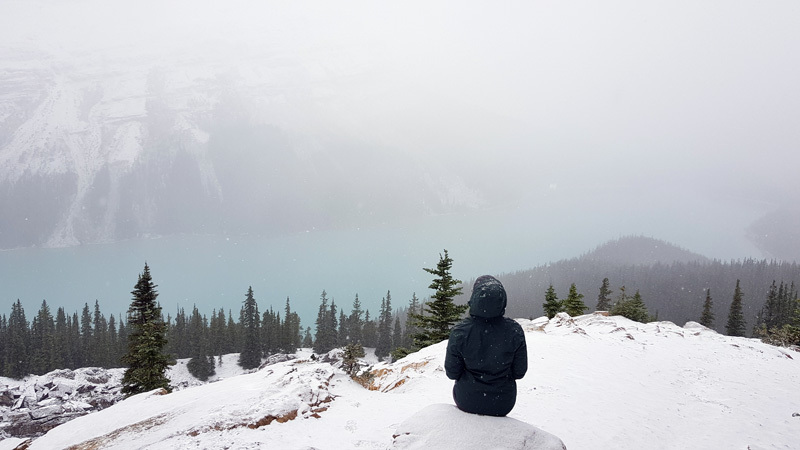 The ticket we had was called the Utimate Banff Explorer which I fully recommend! Buying a combination ticket saves you money and the tickets are really flexible. 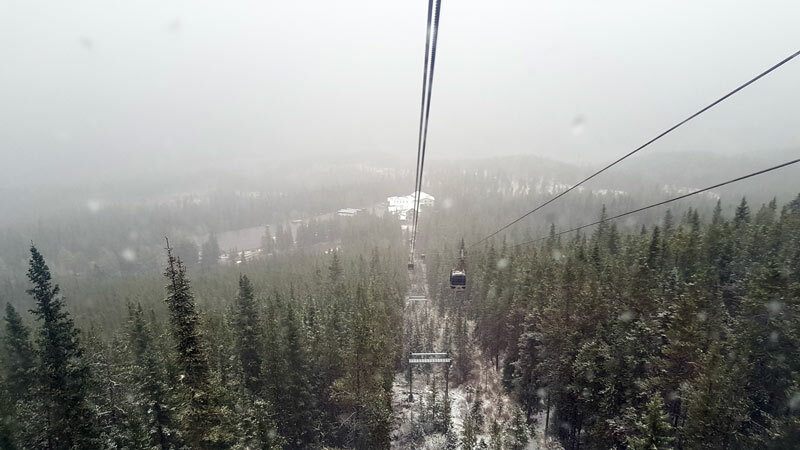 Unfortunately when we took the gondola to the top of Sulphur Mountain, it was extremely snowy and we had to use our imagination a bit... I've included a little video below (SO SNOWY)! It was really magical in the snow but I'd love to go back in the summer. 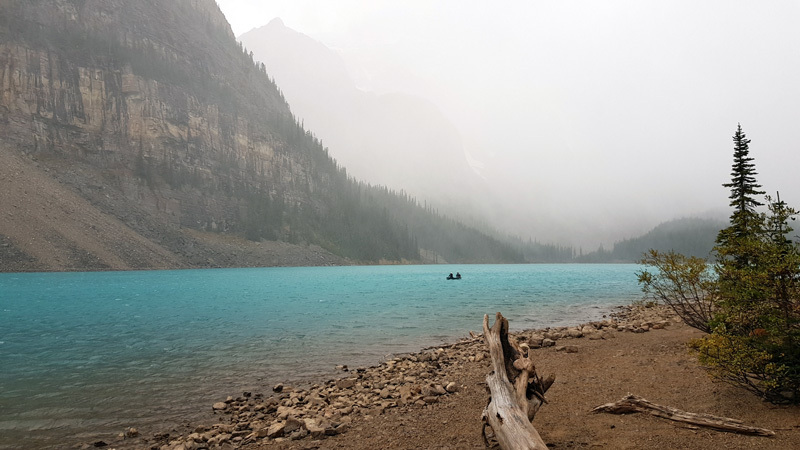 Bow Lake wasn't an intentional stop but it's so lovely, it deserved a spot in my top seven places to visit in Banff! 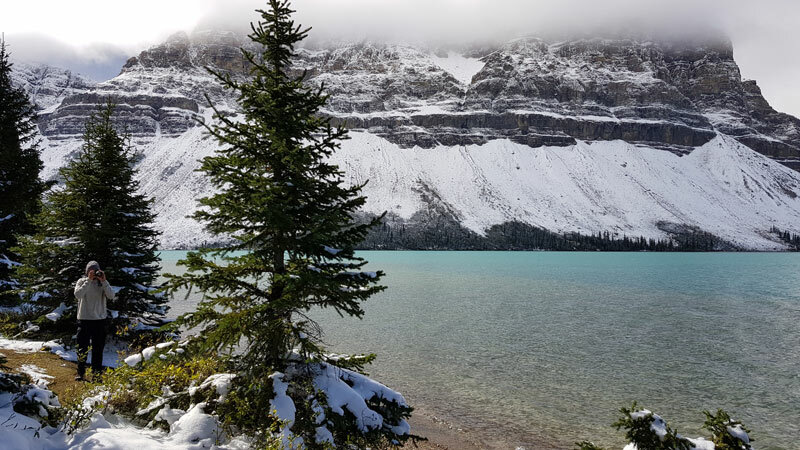 It's about 30 miles north of Lake Louise and I recommend passing by the Num-Ti-Jah Lodge, even if it's just for the photo opportunities. We didn't spend long here but it's pretty impressive on a sunny day. 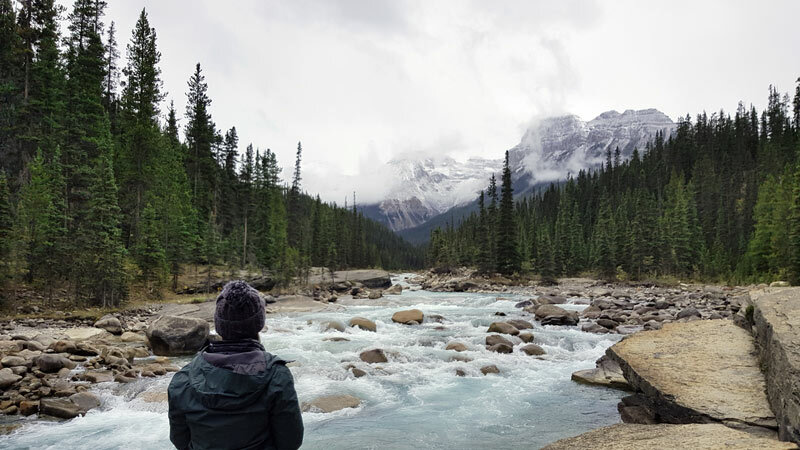 When I was researching where to stop along the Icefields Parkway, I came across an article where the writer had mentioned she loved Mistaya Canyon so much that she named her daughter after it! This convinced me we needed to see it and I'm glad we did. It's certainly worth a quick pit stop but again, get there early, it gets busy quickly. We actually spent a really long time here - it's very peaceful (in a weird way because it's quite noisy due to the rushing water) making it the perfect place to just sit and take it all in. Probably one of my favourite spots in Banff! I didn't take many photos here because I was just in awe. OH HELLO THERE. 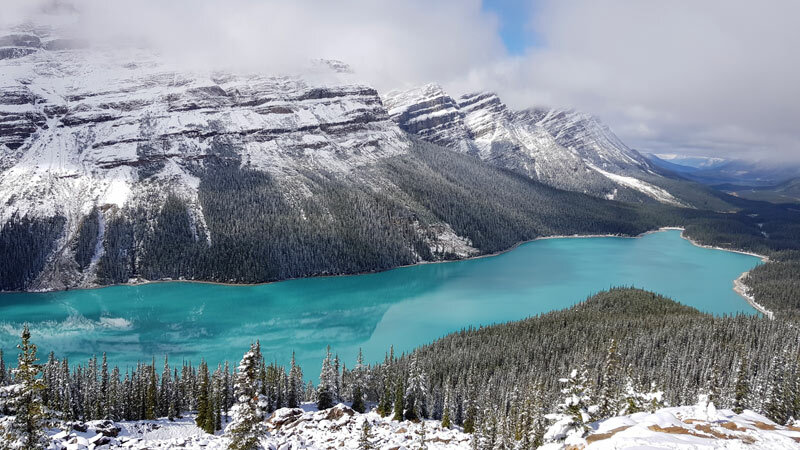 Peyto Lake is probably the most popular lake on Pinterest. 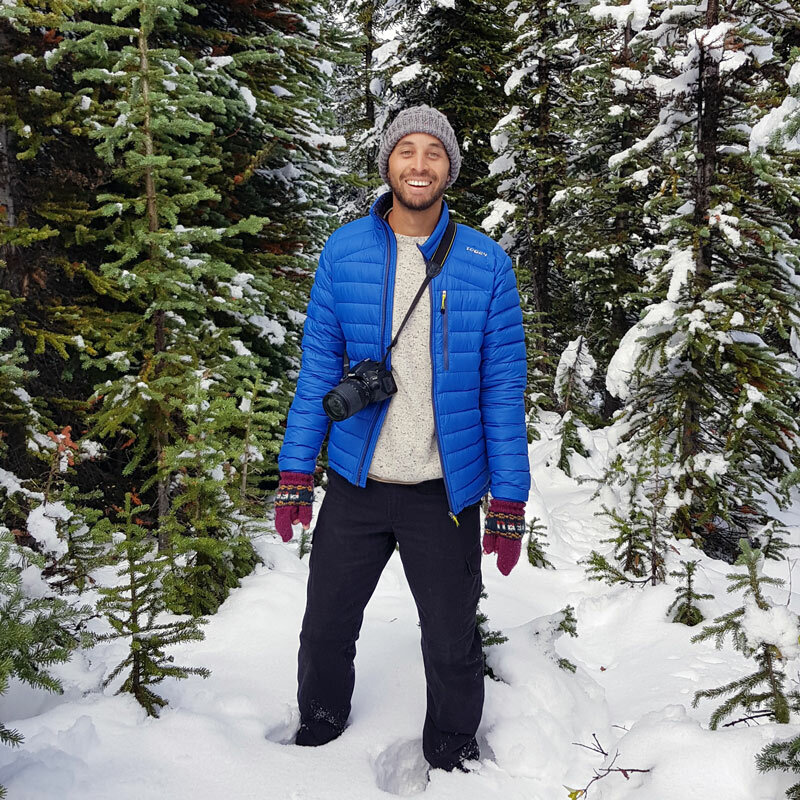 It's the place you have to visit in the Canadian Rockies. We visited twice, a few days apart, the first time was during the snow - hence photo number one. It was very cool but we were there for the turquoise water. 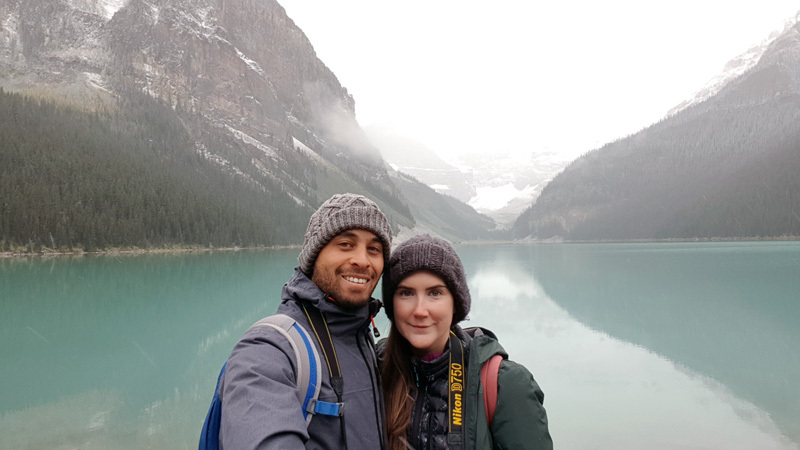 So when the sun came out and we were on the way to Jasper (you'll want to drive up and down the Icefields Parkway a few times), we visited again during late morning. It was extremely busy and I had to get my elbows out but it was worth it for that third photo. This is my favourite place in Banff. For sure. This was the perfect honeymoon destination for us and I'm so glad we didn't just go for the obvious choice *cough* Maldives *cough*. Canada has breathtaking scenery and the locals are really kind and friendly. So there you have it! We'll definitely go back in summer - maybe for our ten year wedding anniversary. I have a few more content ideas so my next post will be up within a few weeks. If there's anything in particular you'd like to read - just let me know! P.S All snaps were taken with my Samsung S8+. What a phone.